Background/Purpose: RA is a debilitating disease that can impact health-related quality of life (HRQoL) through impairment of activity, loss of independence and reduced work productivity. 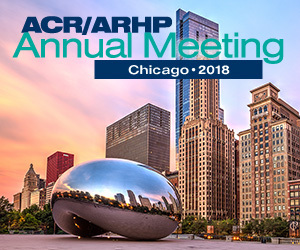 Year 1 data from the 2-year head-to-head AMPLE study showed comparable improvements in HRQoL and similar onset of response with subcutaneous abatacept and adalimumab on background MTX for multiple patient-reported outcomes (PROs).1 Longer term data are important to assess maintenance of response over time. Here, we present PRO data from 2 years of the AMPLE study. Methods: AMPLE is a Phase IIIb, randomized, investigator-blinded study. Biologic-naïve patients with RA and an inadequate response to MTX were randomized to 125 mg abatacept weekly or 40 mg adalimumab bi-weekly, with background MTX. Pain, fatigue, and patient global assessment (PtGA) were measured by 100 mm visual analog scales. Physical function was evaluated using the Health Assessment Questionnaire-Disability Index (HAQ-DI). HRQoL was assessed using the Short Form-36 (SF-36; including Physical and Mental Component Summary subscores [PCS and MCS]). The Activity Limitation Questionnaire (ALQ) measured the number of days patients were unable to perform usual activities during the past 30 days. Psychosocial independence was assessed using the ALQ plus the Role Emotional, Social Functioning and Role Physical subscale items from the SF-36 survey. Physical independence was evaluated using 15 items from the HAQ-DI. The Work Productivity and Activity Impairment questionnaire assessed work productivity. Data are mean (SE) improvements from baseline, unless stated otherwise. Results: 646 patients were randomized and treated with abatacept (n=318) or adalimumab (n=328) on background MTX. Baseline characteristics were balanced between the two treatment arms. A similar proportion of abatacept- and adalimumab-treated patients (54.1% and 48.8%, respectively) achieved a HAQ-DI response (improvement of ≥0.3 units from baseline) at 2 years. Improvements [% (SD)] in PtGA at 2 years were 43.5 (3.7) vs 40.6 (3.6)% for abatacept and adalimumab, respectively. Improvements in all domains of the SF-36 observed at 1 year were maintained at 2 years (PCS: 9.3 [0.6] vs 8.6 [0.6]%; MCS: 4.1 [0.6] vs 3.3 [0.6]%, abatacept vs adalimumab at Year 2). Comparable improvements in activity limitation, independence, and work productivity were observed between the two treatments (Figure). 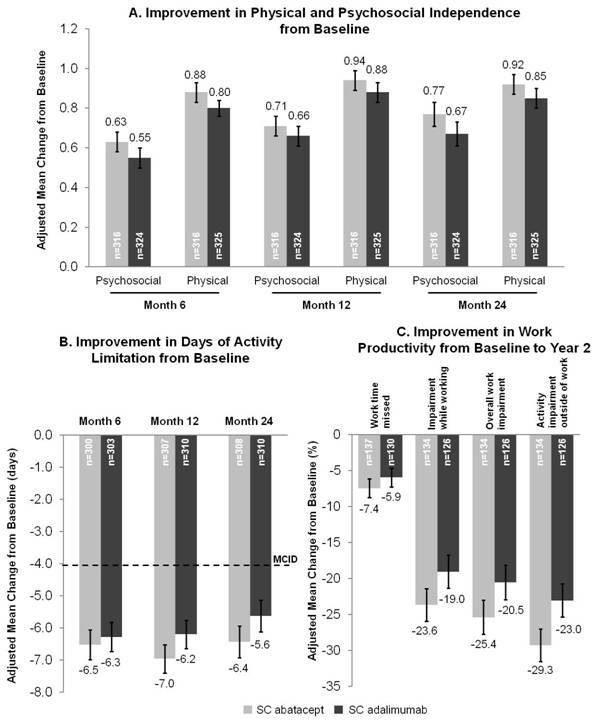 Figure: Mean change in independence, activity limitation, and work productivity over 2 years. Error bars=SE. MCID=minimal clinically important difference. Conclusion: Year 2 data from this head-to-head study show that the improvements in PROs, including productivity and independence, with both SC abatacept plus MTX and adalimumab plus MTX observed at Year 1 are maintained up to Year 2, with similar onset and durability of response. Reference: 1. Fleischmann, et al. Arthritis Rheum 2012;64(Suppl 10):S577.